Description: Oceanic Iridescent Blue/Green Jeweled nautical shells, surrounded by Blue and Red jewels, highlight an intricate Art Nouveau motif in Amber and Clear Ripple glass, accented with iridescent Amber formed jewels on Bone Beige. A Multicolored ringlet motif featured on bottom accented with Amber oval jewels while Amber diamond shaped jewels accent the top. 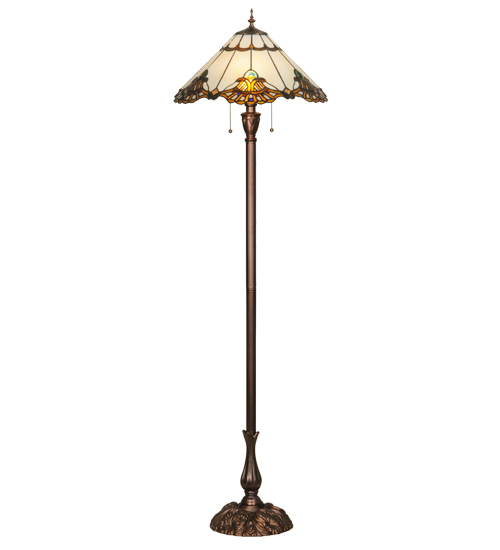 The shade was handcrafted using Meyda Tiffany's famous copper foil construction process and complemented with a floor base finished in Mahogany Bronze.